Remember back in the day when “mile-high club” referred to getting busy in an airplane bathroom? Well, now it seems to have taken on a whole new meaning. Mile-high fights are all the rage, and two passengers on a flight from Tokyo to Los Angeles came to blows Monday night on All Nippon Airways. 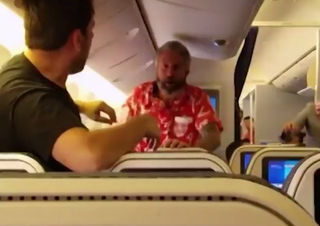 According to CNN, the video was captured by passenger Corey Hour, who said that everything was fine until one man, wearing a Hawaiian shirt, just went ballistic. Hour said that the man stopped fighting but then returned and started acting up again. That’s when Hour stopped recording and jumped it. “I was the one who stepped in. He backed down, I squared up with him and he wouldn’t confront me,” Hour said. The man in the Hawaiian shirt was eventually escorted off the plane, and according to CNN, the man was reportedly intoxicated. Which now explains the hideous Hawaiian shirt.